Every day I am amazed at the friends that I have but today is not a day for me. Today is a day for all of us. For us to rise up, to be strong for those of us that can’t be. For us to stand up, and be guided for those of us who are lost. For us to smile, to laugh, for their are those around us who are weary. We can either take this day and lift a hand for another or we can wonder when no one comes to lift a hand for us. I have a friend who is without a job today. He went home to his wife and kids and doesn’t have a plan. He has severance, he has unemployment, and he has his dignity. What he doesn’t have is a job. I can support him, mentally encourage him with all my heart, but it still doesn’t feed his family. We can help each other as a world, but we choose not to. Everyone has turtled into a situation where we don’t care about anyone but ourselves. Selfish, probably. Necessary? That depends on you. We’ve got people walking a thin line. and the bar is getting further and further. But we have to know that if we don’t walk that line, someone else is in the wings, staring for that opportunity to walk that line. After my car accident, the bills have come pouring in. I can not and will not be able to afford them all. Have I worried about it? No. Because the creditors can take only so much blood from me before I am gone. I was talking to my friend Don Carpenter today and he noticed that I seem “different”. I’m not different, I’m the same ole Sean. I’m far from perfect and I make mistakes like we all do. But today is a day for someone else. Don found something that I could use that he wasn’t using anymore and I am using it. I will find something that I am not using and give it to someone that needs it more than I do. For today is not a day where I can understand the past. No, the past , both positive and negative have made me who I am. The accident changed my soul for the better, my back for the worse. I can not make miracles. I can not make friends. I can make people see me for me. The picture above was taken by me Saturday at the Science Spectrum. 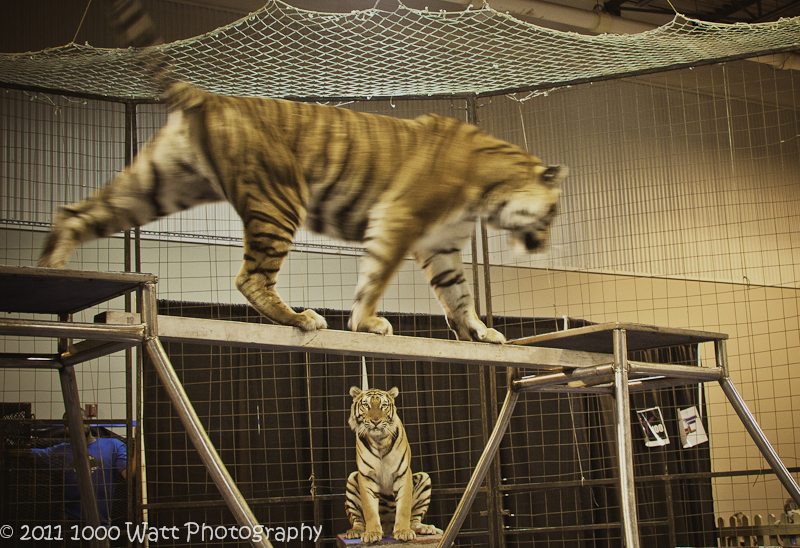 I had my camera and arms inside a cage with a very large assortment of angry kitties. Fear has run my life for too long. I fear losing the people I cherish the most, but the people I try to hold close to me have found themselves lost to me. I am not a great father. I will never win a father of the year award because I let my kids go. I thought back in the days of my divorce years, that letting the kids go with Angela was the right decision. I was 100% wrong. I should have fought for them to stay in the Lubbock area or wherever I was close to. I made that mistake and the fear of holding my kids too close has pushed them away. I take full responsibility for my actions. I don’t have money, nor fame, but people I care about. I have lived in fear too long. There is a tiger staring at you now. You can choose to sit behind the safety of the bars through a long lens or get in the cage for one terrifying moment. For one moment I got “in the cage”. I stared a tiger down and had to be told to back away “for my and the tiger’s safety”. Today is my day again to stare at the tiger. It may not be anything important, but sometimes remember for all the days that you get into the cage, someday the tiger must be fed. Make sure you push your boss in first. Cause, once the tiger eats, they get tired and wanna nap. I’m thinking of my friend and will do anything he asks me to do. But I can not push my will on him. He must walk into the cage on his own.